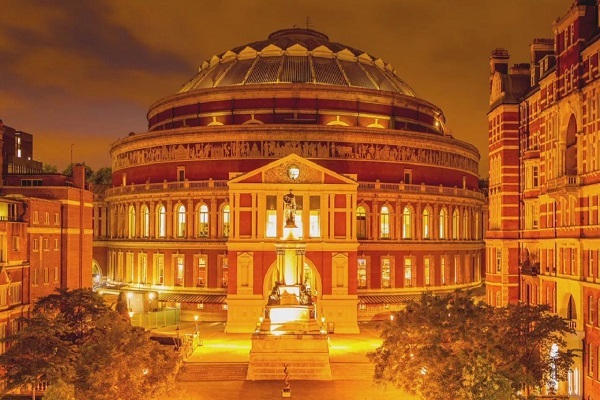 The Royal Albert Hall is one of the world’s most famous stages. Opened by Queen Victoria in 1871, the hall hosts more than 360 events a year, including classical music, jazz, world music, circus, rock, pop, opera, dance, comedy and tennis. In 1871, the Royal Albert Hall opening year, they staged just 36 shows. They now host almost 400 events in the auditorium and many hundreds more around the Royal Albert Hall every year. "The advancement of the Arts and Sciences"
The mosaic frieze that encircles the building measures 800 feet long and 5,200 square feet, and is formed of foot-long slabs of mosaic tesserae depicting the advancement of the Arts and Sciences of all nations. In 1866 the Hall’s architect Major-General Scott RE requested the mosaic be sculptural, however time and money constraints meant that mosaic was adopted.